I drew a quick sketch of what this game will be. I've been way into the low poly matte color renders I keep seeing pop up on Twitter so I wanted to take a stab at that. My main goal for the jam is to learn some more modelling basics and model, rig, animate, and uv some stuff for the first time. 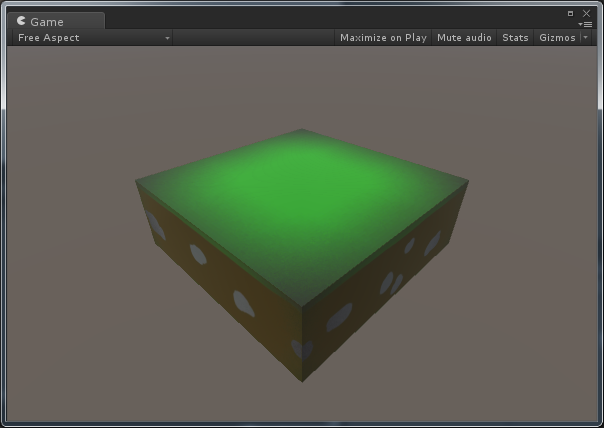 I'll probably spend the next day or two focusing on learning Blender stuff before even opening Unity. 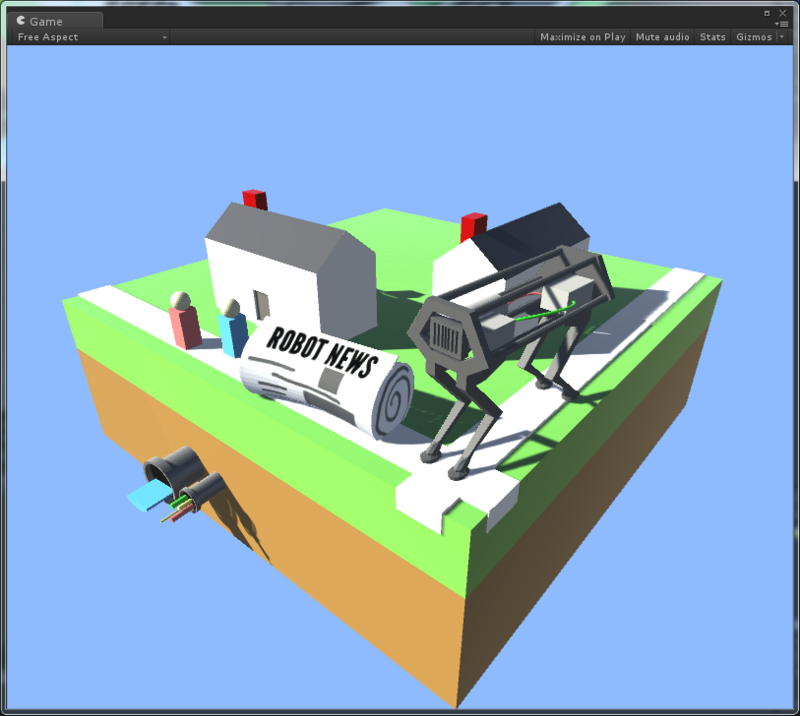 Basically this game will be you controlling a BigDog robot as it delivers newspapers to a neighborhood. Everything will go fine and no robots will kill all humans. I donno how much of this is intelligible to anyone else, but here it is anyway! I drew a quick sketch of what this game will be. I've been way into the low poly matte color renders I keep seeing pop up on Twitter so I wanted to take a stab at that. Can you link to an example of this? The game sounds really cool. I remember when I was 7 my neighbor told me that he knew a cheat code that would give Paperboy a machine gun, but he never showed it to me. Now is finally my chance! I look forward to this contemporary Paper Boy. Blender video-tutorials are awful in my experience. If you are a video-tutorial person, look for tutorials where they have the key-logger thing on the screen because they will inevitably use a short-cut without telling you how to get there. The tutorial that I found most helpful was one where dude builds a car and paints in in less than an hour. It was helpful to me to see the entire process before seeing things like adjusting how the screen is arranged and having all the "why"s explained. I'll find that tutorial. I know some people don't use video-tutorials though. Oh man, I totally get what you mean by the pastel look. It looks great. The two examples that came to mind when you mentioned low-poly matte renders were Infinite Ammo and bitmOO's Gemu no Gemu, and Chelsea Saunders' Babi Glo. Although Babi Glo is more tone-rendered, whereas the examples you gave are more low-poly-with-realistic-shadows. I've been going through this guy's tutorials too, and they've been really helpful! Mostly because he uses keyboard shortcuts for everything, and he's got a keylogger on, so if you're not sure what he's done (Because he moves quite quickly and doesn't announce everything he's doing), you can go through the video slowly. After two videos I find that I'm pausing much less and I'm much more comfortable using keyboard shortcuts. Yeah I finished that first one (modelling) last night and thought it was very good. It ended up taking me a few hours to get through the 23 minute video, but I feel like I have a stronger hold on using Blender than I had last time I poked at it. Next up is texturing, then rigging/animating...then I scrap all of that and start actually working on my game. This is great! I've found tutorials for Blender to be pretty bad, but these look wonderful. I finished the uv and rig tutorials by that guy (which were also solid) and started poking at doing my own stuff. Here's a first attempt at the ground for this game. I think I baked the AO when the normals were inverted. Also the borders on the UVs are a little weird, so I had to tweak them a bit in Photoshop. It is technically progress. I tried rigging this leg yesterday. It did not go well! I'm gonna take another shot at that in the afternoon, and maybe fill in more of the body. I only just got around to reading your notes from the first post, and 'Hit humans and other objects in level to destroy them' is a particularly great sentence. EDIT: That screenshot is GOOD. Still procrastinating on rigging and animating, so I started making this into a game instead. In the gif the newspapers leave a weird trail in the air that you can't see in engine, which actually is kinda neat so I might implement that? Also there's a weird seam or somethin' in my houses that you can see in the shadow, I don't know what to do about that. This looks so wonderful and goofy. Here's some authentic Big Dog noise samples that I had ripped from youtube, you might have some use for them in this project. Thanks! I will definitely use these. I think I like the 2nd one better. There are two Shadow Bias values on your Directional Light, adjust them a bit higher (BUT NOT TOO HIGH!) and it should show less or no seams. Also, love the progress so far! Can throwing newspapers at people kill the people? Just like in the real robot apocolypse? Adjusting down the Normal Bias seems to fix it? Thanks! As for killing all humans, we're not talking about that quite yet. I really like the day/night system. The grid spacing of the houses makes it very easy to get all the houses in a single pass (with a bit of practice). Any plans for other layouts/levels? Honestly I'm not sure? Maybe I'll create a few different house/street configurations and randomize them. 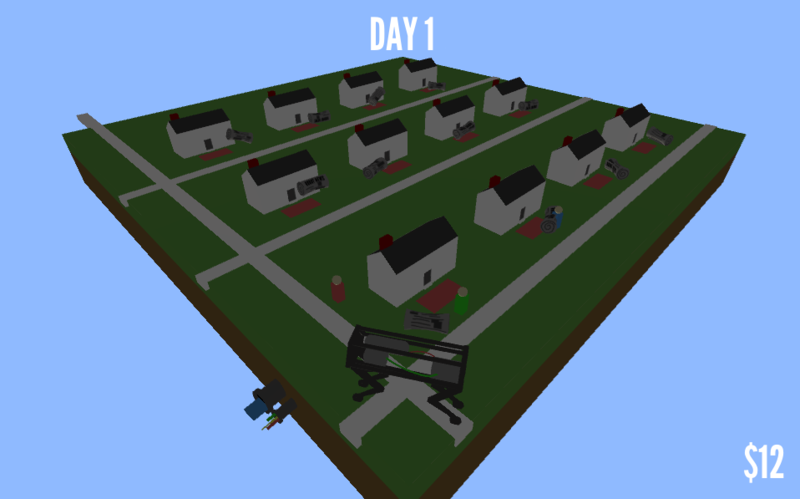 It sort of depends how I implement the 2nd phase of the game, I'm still deciding how I want it to play out. The new version is a little different; you only patrol along the front-right edge. I donno if I'll keep it that way, I was just finding it difficult to aim while on the back left/right edges because the targets face the wrong way. I definitely wasn't able to get them all in one pass, so good job! Yeah, I found it impossible to land any when roaming behind the houses. As you approach the first house, charge for about 1.25 secs and release. Then charge for a little less than a second and release. Finally a very quick click, release as soon as you click. If you time it right, your first paper should fly over the second row of houses and roll to the house in the back. The second paper will land right on the mat of the second row, and the third paper will land right on the first mat. The trick is doing it somewhat perfectly for all four coloumns.